Jesus came near the city of Jericho. There was a blind man sitting beside the road. The blind man was begging people for money. When this man heard the people coming down the road, he asked, "What is happening?" The people told him, "Jesus, the one from Nazareth, is coming here." The blind man was excited and said, "Jesus, Son of David! Please help me!" The people that were in front, leading the group, criticized the blind man. They told him not to speak. But the blind man shouted more and more, "Son of David, please help me!" So often we let the noise and commotion of our crowded lives distract us from Jesus' presence in our lives. Deep down, we know that we need time in his presence—time that comes from prayer and reading the Gospels (Matthew, Mark, Luke, and John in the New Testament). So let's intentionally cry out each day, "Jesus, Son of David, have mercy on me!" Let's invite Jesus into our busy lives. 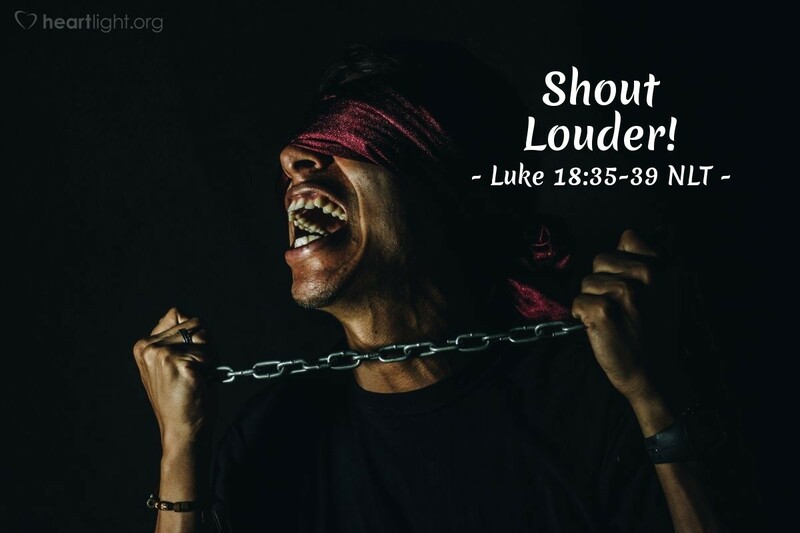 When we let all our distractions and responsibilities crowd Jesus out of our lives, let's shout louder! If the blind man in Jesus' day wouldn't be silenced until he came into the presence of Jesus, then we shouldn't settle for anything less today. Father, forgive me for letting the noise and "busyness" of my life crowd Jesus out of my life. Make my heart yearn to learn more of Jesus each day. In Jesus' name. Amen.